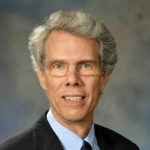 David Wheeler, PhD, received his Bachelor of Science in Biochemistry and Zoology from the University of Maryland and Ph.D in Molecular Genetics in Cancer Virology at George Washington University. His Postdoctoral research was in behavioral genetics of fruitflies at Brandeis University with Dr. Jeffrey Hall. There, he and his colleagues cloned the period locus, the first gene with an established role in regulating complex behavior (circadian rhyhthms) in any organism. His work laid the foundation for the Nobel Prize in Physiology and Medicine awarded to Drs. Hall, Rosbash and Young in 2017. As Director of Cancer Genomics in the Human Genome Sequencing Center at Baylor College of Medicine, he has contributed ground-breaking research into the role of somatic mutation in tumorigenesis through DNA and RNA sequencing in large-scale cancer cohorts. He was a member of the Executive Committee of the The Cancer Genome Atlas and a member of the International Cancer Genome Consortium and serves on the editorial board of Genome Research. Dr. Wheeler’s research focues on deciphering the role of somatic alteration in cancer initiation and progression, and in identifying the genetic mechanisms that give rise to drug sensitivity and resistance phenotypes in cancer patients.